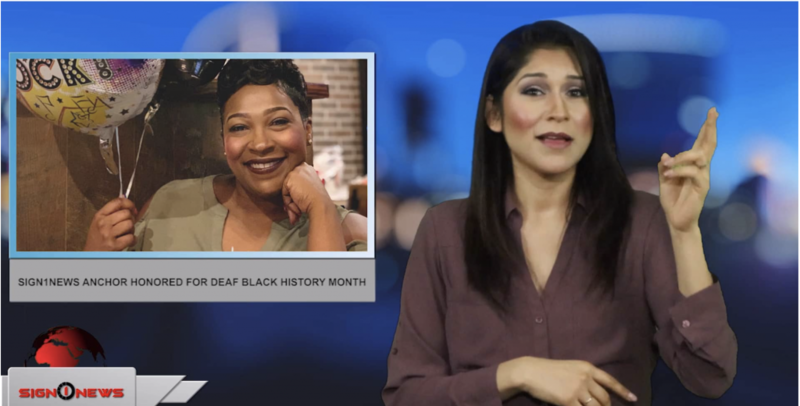 We want to send out a big congratulations to Sign1News anchor Candace Jones for being recognized during Black history month as one of the many leaders in the Black Deaf community who was made a positive contribution in the community and around the world. Sonja Conyers, Cathy Tutt and a team of educators at the South Carolina School for the Deaf and Blind put together a beautiful collage of pictures of powerful African-American Deaf influencers like Jones, lawyer Claudia Gordon, basketball player Curtis Pride and actor CJ Jones who are making positive impacts in the Deaf community right now. And in Florida the Deaf Literacy Center has been celebrating Black history in the Deaf community for over 12 years. Each year the Center highlights contributions of African-American Deaf and hard of hearing individuals whose contributions are shaping Deaf history. Rosa Rodriguez sent us pictures of the Center’s collage of Deaf Black leaders like National Black Deaf president Evon Black, actress Michelle Banks, filmmaker Jade Bryan and, of course, Candace Jones. Rodriguez says the collage was actually inspired by Jones herself. Jones encouraged many of her Atlanta Area School for the Deaf coworkers to decorate their doors to honor Black History month and she posted the pictures on social media. Again congratulations Candace for not just being a leader at Sign1News but also being a role model in the community.